Pros: At the time of this card's release, it ran HL2 games without a hiccup. 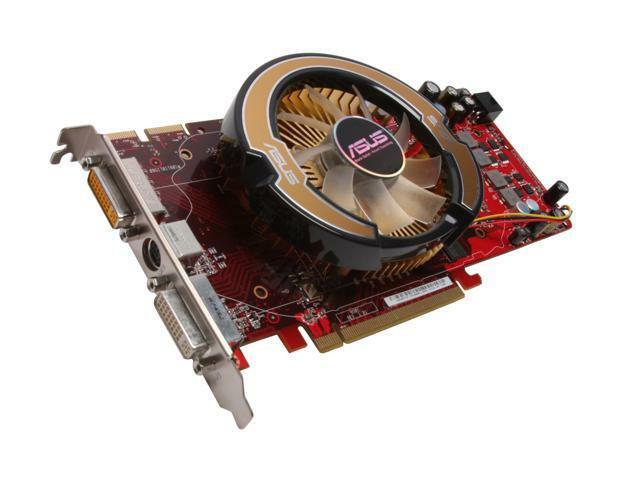 I had a CrossFireX setup with two of these cards and it ran all my games with high 100+ frames. Cons: Unfortunately it had a huge FPS drop in CS 1.6 and similar games of that sort. The newer games performed better but older games it gave unstable frames. Other Thoughts: At one point I had 3 of these in multiple computer builds. I don't know why I went back to this card but it was such a good crossfire X set up at the time. Ran on the hotter side 63 idle and it can shoot up to 80c while under load. These cards are still alive but unfortunately it is outdated as it cannot run any newer end games and Windows 10 doesn't support this card. Comments: Definitely got my moneys worth out of this card. Thank you ASUS. Cons: Was always overheating. even tried underclocking it to reduce heat. Other Thoughts: I eventually replaced stock cooler and placed a large zalman fan with copper heat pipes and still ended up with heating issues. The card evenually died completeltly (after a few months of shutting down at high loads due to heat). Pros: Great software included, overclocked out of the box, quiet fan, fast! Also includes crossfire cables. Cons: Requires 2 slots, but the fan's worth it. Other Thoughts: Great buy, especially if you catch a good rebate offer! Pros: I have two of these cards setup for crossfire and they pwn just about every game I have. I run a 1680x1050 monitor with AA and AF cranked up and vsync on every game. The factory overclock is nice and I haven't tried to go any further as not much of a performance increase will be noticed. Cons: The cards run pretty hot even set at 100% fan speed. The top card in the crossfire configuration runs 5-10 degrees Celsius hotter than the one on the bottom. I ordered two high CFM fans that I am going to place over the cards to help keep the temps in check. Other Thoughts: I never received my first rebate from asus when I ordered my first card 6 months ago. I am not sure if I will get this one, but I did want to make sure and have two of the same cards in crossfire. Cons: -After market cooler is worse at load and manually increasing fan speed doesn't help. Other Thoughts: I have the EAH4850 original and the EAH 4850 Top. Both work great. The original runs really hot when idle, but if you manually turn the fan up it will cool down A LOT. The one with the after market cooler, runs a little cooler at idle but gets even hotter than the original under load. The thing that caught me by surprise was that even manually increasing the fan speed to 100% did not help. Pros: Overall the card is an excellent performer for the money. The card runs cool and is very fast. Cons: Currently there is a problem with the ASUS 4850 512MB showing 1GB memory in CCC and dxdiag. The problem with this is that WoW attempts to uses this non-existent memory and crashes. CCC shows this a "hypermemory" which is NOT supposed to be used on this card, and if it is implemented, is buggy. This is listed as a "known problem" with ASUS 4850 cards by Blizzard. Even RMAing this card will just get you a new card with the exact problem. ASUS does NOT respond at all on their forums and in general have some of the wors technical support that I've run into. Other Thoughts: Stick with EVGA. Cons: started to have problems with card overheating and causing system lock screen freeze and artifacts while playing WoW.. I'm not sure if RMA will fix that as this is issue consists from what i hear. We are sorry for this inconvenience. Please contact our Technical Support Department at http://vip.asus.com/eservice/techserv.aspx and reference case number "NE397763" so that we may get more details about your system configuration and assist you in resolving these issues you are experiencing.